This is one of those salads that can be very versatile! If you increase the portions, you can make a wonderful lunch or dinner. 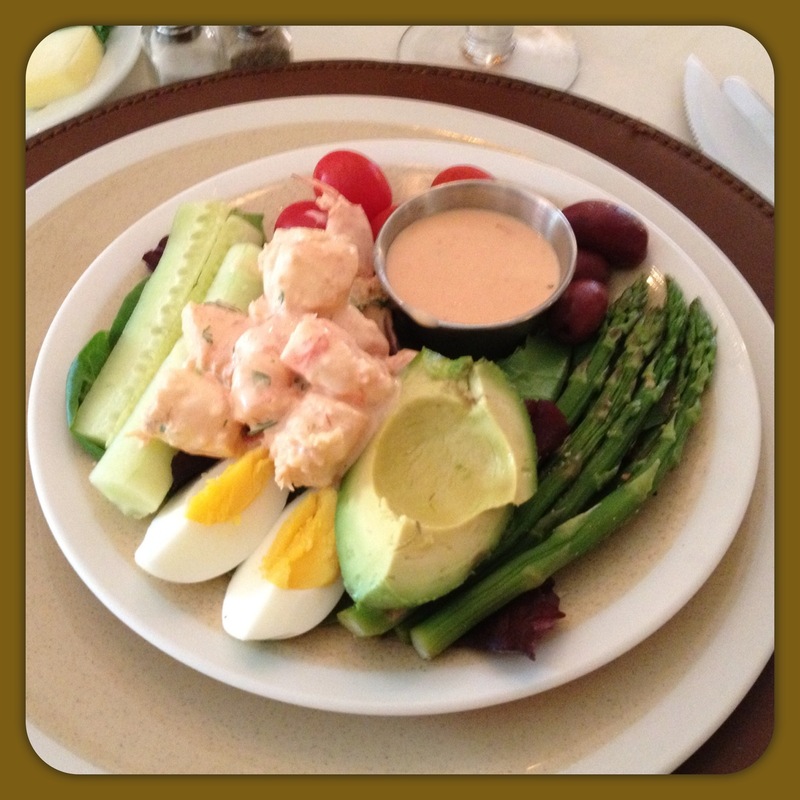 You can also substitute the shrimp with real crab meat and it becomes Crab Louis Salad, also delicious! This recipe is for 4, you can increase the proportions for more servings. Mix all of the above ingredients in a medium size bowl, blend well. Cover and store in refrigerator until ready to use. (Can be made the day ahead and stored in an air tight container in the refrigerator). Prepare all salad ingredients and group together for plating. Only use, for best taste, wild caught shrimp, no farm raised shrimp. Place all ingredients (except shrimp) in a large pot. Bring water to a boil and let boil for 10 minutes. After the 10 minutes, add the shrimp with the shells. Cook for 2 1/2 to 3 minutes. Do not overcook! Remove from heat and immediately place the shrimp in a bath of ice water, this will stop the cooking process. Let the shrimp set up for 10 minutes in the cooled water, then drain the water. Use a deveining tool and remove the shell, veins, and tails of the shrimp. Cut the shrimp into 3 pieces each. Set aside. (You can now refrigerate the shrimp in an airtight bag or container overnight if preparing this recipe in advance). About an hour before you are going to serve the salad, mix the shrimp with about 3/4 cup of the Louie dressing, add more if it seems to dry. Place back in the refrigerator to let the flavors mix. Make sure to taste the shrimp and add salt if needed. Use 4 salad plates and 4 small containers to hold the dressing. Place the container on the plate and fill each container with the Louie dressing in order for each person to pour the amount they want on their salad. Fill the plate with the lettuce. Arrange the cherry tomatoes, olives, asparagus, cucumbers, and eggs around the edges of the plate, leave room the the center for the shrimp. At this point, you can cover the dishes with plastic wrap and refrigerate for later use, if not serving immediately. Do not peel the avocado and place it on the plate until the last minute and right before serving or it will turn brown. Final preparation would be to spoon the shrimp evenly between the plates and peel and cut the avocado into quarters with each plate receiving one quarter. Now serve immediately with the extra dressing on the plates for individual taste. This entry was posted in Soups and Salads and tagged boiled shrimp, CRAB, crab louis salad, CRABS, dinner, lunch, SALAD, SHRIMP, shrimp louis salad, shrimps. Bookmark the permalink. Mary, This was wonderful! A high light of your dinner! Thanks Cathy! It was a fun evening! Thank you for sharing this elegant recipe…so great that there are so many make ahead steps.! Thanks Mercy, it’s great to make ahead and enjoy the next day!